Over 55,000 vehicles traverse the storied Western Hills Viaduct. The iconic art deco era viaduct, constructed as part of the Cincinnati Union Terminal project in 1932 replaced the older Harrison Avenue Viaduct. The viaduct last saw renovation in 1977, almost twenty years after the eastern section was demolished to make way for Interstate 75, but over the last few years a team of city, county and consultant engineers have been studying ways to repair or replace the aging bridge. 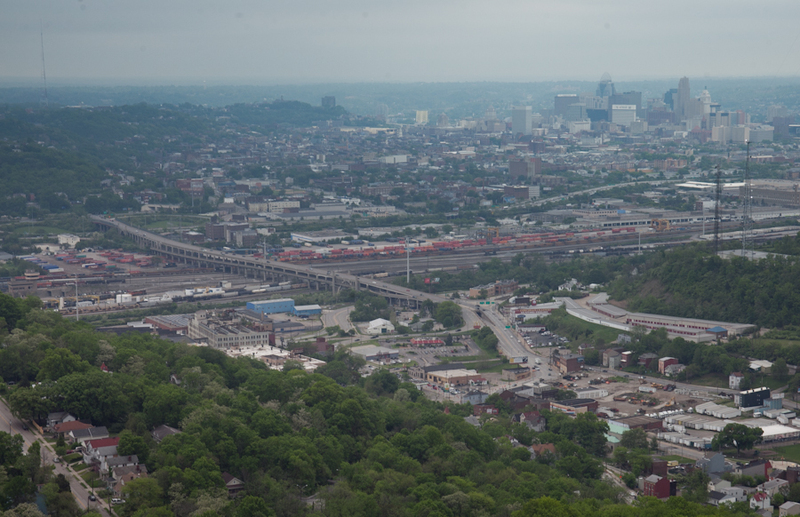 The city’s Department of Transportation and Engineering (DOTE), Hamilton County Engineer’s Office and URS are working together to determine the future replacement of the aging viaduct. The team will be hosting two public meetings on Thursday to engage adjacent property owners and frequent users of the bridge on the process of replacing the viaduct. The Western Hills Viaduct is one of a few crucial road connections to the west side of the city. Photo by Jake Mecklenborg for UrbanCincy. Because of the amount of repairs needed to maintain the existing viaduct, the team is not considering continuing the use of the existing viaduct. 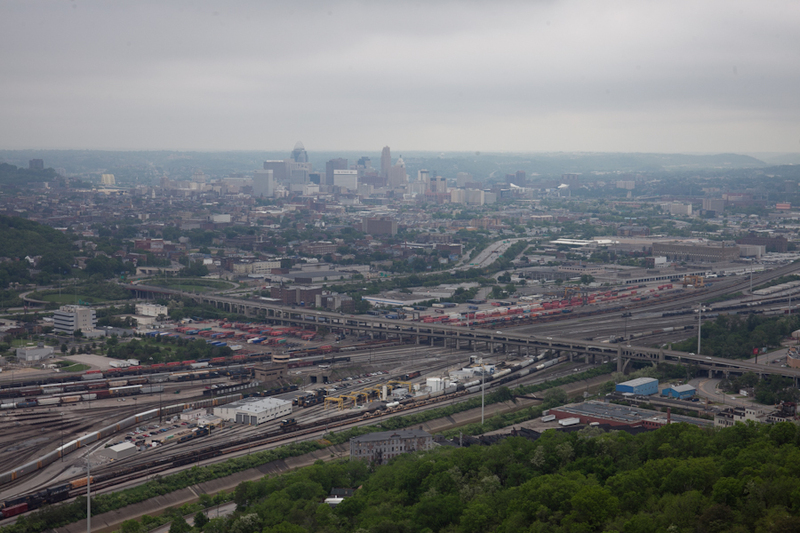 Instead the team is looking to build a new viaduct just south of the Western Hills Viaduct. Richard Szekeresh, Principal Structural Engineer with DOTE told UrbanCincy that there are a number of other projects and factors that constrain the teams ability to determine a suitable relocation alignment; such as the rail yard operations below the bridge, the Metropolitan Sewer District’s (MSD’s) Lick Run Valley Conveyance System project, and Ohio Department of Transportation’s (ODOT’s) proposed new connection bridge from I-75 to the viaduct which is part of the Brent Spence Bridge project must be factored into the new location. Additionally because of hillside grade issues at the McMillan and Central Parkway intersection a new alignment north of the existing viaduct would be extremely challenging and more expensive. The team is studying whether to pursue another double-decker bridge or a single level span as the replacement alternative. Some private property will be affected along Harrison Avenue and Central Parkway along with the existing rail yard below the viaduct. Additionally, the team is looking for input on bicycle lanes and other transportation alternative improvements. The design team hopes to have the engineering completed and a preferred alignment selected by 2014. The cost of the viaduct replacement would be an estimated $200 million. No funding has been identified and the project is not part of the Brent Spence Bridge project, even though it is in the northern edge of that section of the I-75 reconstruction project area. Both of Thursday’s sessions will be at Cincinnati City Hall. One will be from 4pm to 5:30pm and the other from 6pm to 7:30pm. City Hall is accessible by the #1, #6 and #49 Metro buses.